We also install service and maintain Solar PV systems in Essex and the South East. 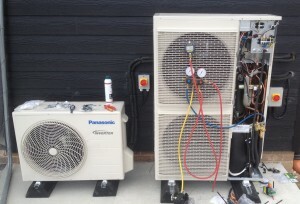 Most of the problems encountered by customers (with any manufacturers Heat Pump) are from poor installation practice , usually from firms that are insolvent who subcontracted the original work out to untrained tradesman . We will access your installation against MCS design requirements and provide a report for you. We will where possible correct faulty workmanship , rewire controls and rearrange pipework , top up antifreeze on monobloc units. correct dosing of antifreeze is not in place . This is or should be an item checked on an a annual service visit. As a F Gas registered company we can fault find on the refrigerant circuit. We would also be happy to engage in an ongoing service contract . The Panasonic Aquarea heatpump has a protective h62 error code, this can turn off the unit and the green light will be flashing on the control panel. This indicates a flow rate which is not high enough in the system . This is usually a problem with the original installation and may need remedial work carried out . At best a differential bypass valve could be fitted at a relatively minor cost , possibly in conjunction with introducing a permanently open radiator ..
We have come to rely on the introduction of a low loss header, this is a hydraulic break or separation between the heat pump and the heating circuit . Invariably performance is increased , air is reduced in the system and ongoing maintenance is likely to be less costly. Please contact PVRE to discuss the possibility of this option. We are part P Electrical contractors and F gas engineers and can fault find all aspects of heat pump installations. We hold the g3 cylinder qualification/ certificate and can service all brands or make of Heat pump cylinder. We supply and install Gledhill and Telford heat pump cylinders. Commissioning of condensing or outdoor units. All refrigerant work is carried out by a F gas engineer. Panasonic Aquarea 5 kw split and a Aquarea 12 kw HT split unit ASHP in Kelvedon Essex.